Your marriage is approaching the 45-year mark. You assume that there isn’t much about your spouse that you don’t know. You’re living in the placid region where issues have been settled or, at minimum, productively ignored. And I say "reasonably" only because you’re not an idiot, and you know that complete contentment lies beyond the reach of ordinary mortals. Something happens that makes you wonder how right you’ve been about your partner. This unsettlement may not arrive in the form of a huge revelation, but it’s enough to upset a carefully built balance. Think of it as a crack in the foundation, worrisome because it’s likely to grow. 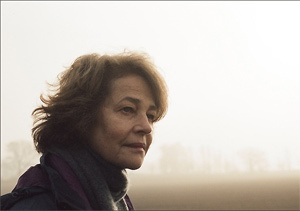 In the case of Kate (Charlotte Rampling) and Geoff (Tom Courtenay), the main characters in the British movie, 45 Years, the news that upsets the apple cart of their childless marriage arrives in the form of a letter. It seems the body of one of Geoff’s former girlfriends, lost on an Alpine ski trip they shared more than 45 years ago, has been found intact, preserved in the mountain ice. From that point on, life changes, most particularly for Kate, who’s in the midst of planning the couple’s 45th anniversary party. Kate isn’t exactly jealous; it’s more that she’s baffled, concerned about her ability to peer into her husband’s heart. And what if it turns out that she was Plan B, the woman Geoff accepted after he lost the woman he really loved? To make this quiet drama work as well as it does requires actors who can operate in the subtlest of modes. For that, director Andrew Haigh has chosen well. Rampling, who has been nominated for a best-actress Oscar, gives a fine, reflective performance as a woman who knows how to maintain composure while her insides are in turmoil. Almost entirely reliant on nuance and suggestion, Rampling’s performance qualifies as one of her best. Courtney upholds the male end of the bargain as a character who mostly keeps his inner life to himself. A retired manager at a local factory, Geoff begins looking at slides of his former girlfriend that he has kept in the attic. He also renews his smoking habit. The movie, which culminates with the anniversary party, ostensibly tells the story of a couple, but 45 Years really focuses on Kate, and it leaves us to ponder how exactly she’s going to continue with the rest of her life now that her relationship has been thrown into an unsettling new light.